It is all about the shoes!Shoes make the outfit. It is so about the shoes! When Craig and I kept Declan the other night I could not resist trying his shoes on him for the photo shoot. 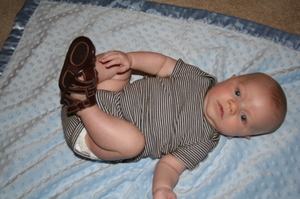 He has several pairs including his sandals which he is modeling here with his blue and brown striped onesie. They will be all the rage this year for 3 month olds! For all of your fashionistas, please note. He will obviously not be wearing sandals or white or white sandals, for that matter, since it is after Labor Day but I did not think it would hurt he he wore them just for the picture. We think he is just too cute for words. Or for shoes. But then, the shoes make the outfit. Blessings and thanks for checking in with me. I taught on James 1:1-4 in the Moms Ministry this past week. James commands us to count it all joy when we encounter various trials because we know God is working a higher purpose and plan into our lives. He is producing endurance and teaching us how to abide up under difficult circumstances. Having just walked through the valley of the shadow of death this summer losing Craig's mom while we were in India, I felt only partially adequate to share about suffering. 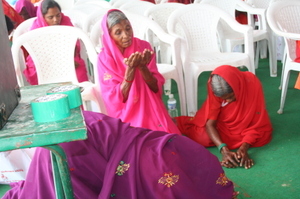 In India I walked among women who are really suffering for Christ. I met women who have been beaten for their faith, maligned and mistreated. I met women who had come to grips with the very real possibility of dying a martyr's death for the cause of Christ. In light of such, my life experience with suffering is minimal at best. Even so, the difficulties of this summer have shown me how to stand strong in the name of the Lord during times of extreme crisis. I have learned what it means to abide in the shadow of the Almighty. I have experienced being sheltered and shut up to Christ. I have been made to lie down in the green pastures and allow Christ to restore my fractured soul. My faith has been tried and tested and it has served to confirm to me what I already knew~my God is faithful! Hallelujah! What a Savior! Girls, Craig and I are headed for Maryville, TN. next weekend. I will be speaking at Madison Avenue Baptist Church on Saturday. If any of you live anywhere near by, please come and join us. The information for the conference is in the column to the left with the phone number to contact the sweet ladies there who will be glad to help you register. I will be speaking 2 times and I am so looking forward to it. Craig is driving me and Paul and Elesa Redmond and Roy and Ray-Ray Terrell are going with us. After the conference we are going to stay over an extra day and go to play together in the mountains, which is our favorite spot. The drive home will be spent discussing why we do not live in the pretty part of Tennessee where we could live on the side of a mountain and fish in the brooks and watch deer out our window and smell the clean mountain air and live in a cabin and hike mountain trails and sit on a rock by the side of a stream and look for bears, and on and on it will go until we come back around to the fact that God planted our roots deeply here in Fayette County and until He moves us, we are put! We dearly love our church, Bellevue Baptist, and our church family means the world to us so the whole idea of moving is a pretty foreign concept, but every trip to the mountains involves this same conversation. I'm just saying! Anyways, I am excited to be going and I hope to see a bear! Blessings. Yesterday was our second session (out of 10) at the Moms Ministry. It was such a blessing to teach so many mommas who want to hear from the Lord and train their children up in the way they should go. I got to have lunch with Stephanie Redmond's group, which was an extra special blessing. Listening to these young moms share about their families is so precious. To see how they desire to grow strong in the Lord stirs my heart deeply. My heart's desire is to give moms a hunger and thirst for the things of the Lord, especially His Word. I truly love the Word of God and want to know more of it! I have watched it change my life and remake my heart! I am writing today on the next study called "Fresh Fire" on the OT prophet, Elijah. He steps onto the scene in I Kings 17 and proves to be a mighty man of faith, but he also falters, which makes his story all the more applicable to our lives. I want to be mighty in the Lord but I have had my share of missteps. I am excited to be writing a new study but I ask that you pray for me as I teach James and study Elijah! It can get confusing! Blessings. Honestly, I think this baby face is too cute for words. Craig and I babysat Baby Love on Saturday night while the kids went to Grub Club with some of their Sunday School class members and Craig and I were lucky enough to get to keep the little Prince. Can I get an amen?!? We had so much fun with him. He had given his mother a fit all day and basically worn himself out so he was great for us. Go figure! We played on the floor, talked about his cats, kissed Mr. Moose and had an all around grand ole time. Oh Declan, that face! I love that face! Here is a picture I took at the front of the church. Craig and I felt like we were watching a holy moment in the lives of our children as they vowed, before the church family, to raise Declan in a Christian home. It was altogether a special evening. My computer and I have reconciled and here is our Baby Love at the Baby Dedication Service on Sunday night at Bellevue. He was deep in thought! But is he cute, or what! He slept through most of the dedication service. But that is okay. In fact, I think Jas and Patti thought it was preferable considering the option. But the purpose of baby dedication is really for the parents and not the children. Parents cannot decide for their children. They cannot make them believe right. All they can do is dedicate themselves to the Lord and determine to live for Christ in the hopes that they will be able to give their children a taste for God and see them come to Christ. 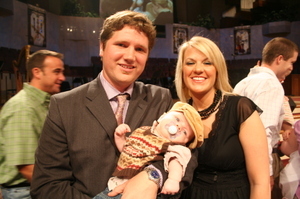 Declan, you don't know it yet but your mom and dad love the Lord God with all their heart and have dedicated their lives to Jesus Christ. They intend to raise you up in a Christian home and teach you the things of God. Your Poppa and JJ, as well as your Straznicky grandparents, pledge to do the same. You are the apple of our eye! Blessings. My computer and I seem to be at odds this morning. Now understand this-I am not a morning person-so if I had to guess, I would fall out on the side of the computer operator and not the computer. But right this minute I cannot make it let me upload the pictures I took of Declan when we had him on Saturday night for a few hours or at the Baby Dedication last night. Trust me, I have pictures. Lots of them. But, try as I might, my computer and I are not on the same cyber-page,so to speak. 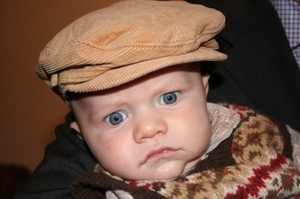 So if you are of a mind to see what Baby Love looked like in his adorable argyle sweater, blue jeans and cap, you will have to check back later in the day after I have asked my buddy Ray-Ray to come up here and jerk a knot in my computer's tail!For the record, I am quite put out! Seriously. Is this cute, or what? I'm just saying. I get to keep the Sweet Prince tomorrow night so I am officially over the moon. A photo shoot will ensue with the said Prince so more pictures of our doll baby are coming. He is 11 weeks old and has nearly doubled his weight. Can you stand it? 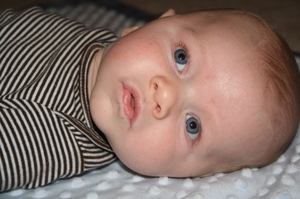 Declan is being dedicated this Sunday night and we cannot wait for this very special night. Blessings! It is good to be back. We started back to the Moms Ministry yesterday and frankly, it felt good to be back. I must say that I am always just a bit anxious when the camera man begins to count down for the live video feed to start. Inside my head I hear a voice saying, "Run, Jean, run. Take off you 10 minute shoes and run. Run like the wind! Run!" The thought always crosses my mind to bolt from the platform, jump in my truck, and head west. 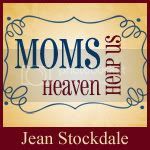 But obviously, I would not want to miss what God wants to do in the hearts of lives of young moms. As the older woman teaching the younger women how to love their husbands, love their children, be chaste, virtuous keepers of the home, I would not want to miss out on what God has in store! Seriously! I am grateful the summer of suffering for us is past and the freshness of fall brings with it the promise of a new season in our lives. It reminds me of a passage in Song of Songs 2:11ff, "For behold, the winter is past, the rain is over and gone. The flowers have already appeared in the land; the time has arrived for pruning the vines, and the voice of the turtledove has been heard in our land." Alright-I realize the seasons don't actually match up, but you get the idea. The season for sorrow and suffering has past and God is making all things new. I'm back and I'm glad! Blessings. If you were able to join me today at Bellevue Baptist for the fall semester of the Moms Ministry, blessings. It was a glorious day and lots of new faces and the reunion of some moms how have been away for one reason or another. Stephanie Vasofsky (or Stephanie V as I affectionately call her) shared her testimony before I spoke. To read her story click here. She is 29 years and was diagnosed in April 07 with stage 4 cancer. She is fighting the good fight and has 4 more rounds of chemo to complete her current treatment plan. She inspired us and challenged us as she shared about this faith walk with the Lord. Her bold witness for the Lord and the incredible grace she is demonstrating was such a blessing. She spoke of her husband's tender care during the long sessions of treatment and her 2 year old, Zoe, and the precious gift she is to them. Stephanie, I am proud of the courageous young woman you are in the Lord. I pray that God will give you that one smooth stone. Thank you for sharing of yourself and your sweet love for the Lord Jesus Christ. To God be the Glory! In India I spoke on Eve and this was my visual aid. 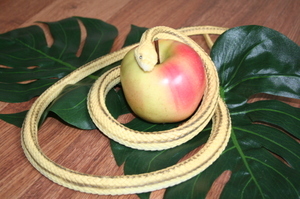 A snake. An apple. A fig leaf. (I was a bit concerned about traveling with a rubber snake that looks so lifelike in my suitcase but I managed to arrive with said snake in tact. However, he did not make the trip home.) Anyways, in the Garden, Adam and Eve gave away the entire estate of mankind because Satan deceived them and enticed them to indulge the desires of the flesh. He cast doubt on God's revealed revelation to them. Satan taunted the woman while Adam stood by and gave up his position as spiritual leader, protector and provider of the home. And the woman saw that the tree was good for food and that it was a delight to the eyes. The tree was desirable to make one wise. Deluded. Deceived. Disobedient. Eve took and she ate and she gave to her husband with her. He ate also. Sin entered. Man's ruin was wrought. All of mankind was plunged into the domain of darkness by the sin of one man. It could only be regained by a Man. But not only man; only a sinless perfect Man could pay sin's debt. It would take the substitutionary death of one Man-the sinless Son of God. Sin-Man's Ruin. The Cross-God's Remedy. Hallelujah for the Cross! Jesus asked Peter three times, "Do you love Me?" Jesus asks the same of you and me today. "Do you love Me?" Not, do you love what I can do for you, but do you love Me for who I am. 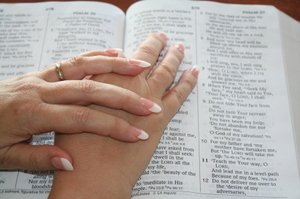 Beloved bloggy mommies, I love God's Word. I believe I learned to love the Word of God from my first pastor, Dr. Adrian Rogers. 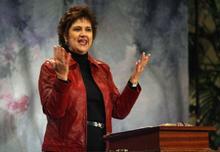 I came to know the Lord under his ministry and I sat under his preaching for nearly 28 years. I believe his living legacy in my life is the love of God's Word. I dearly love God's Word. I believe the study of it and close attention to the obedience of it changes lives. I believe it has changed me and continues to change me and conform me into the image of Christ. So the question today is this, "Do you love Jesus?" 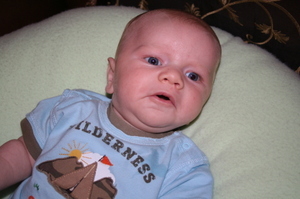 If the answer is "yes", beloved bloggy mommies, you are constrained to love His Word too. To read it. To memorize it. To obey it. To fall in love with it. Jesus asks, "Do you love Me?" Craig and I got to keep Declan for a few hours and I just had to do a quick photo shoot. He is so good natured. 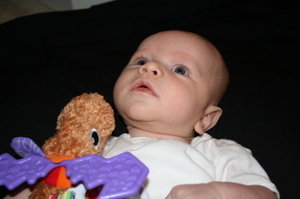 And he just loves his Mr. Moose. After he ate I changed him into his jammies and got him ready for bed. We had a little chat and then I put him in his bed where he entertained himself with his mobile until he closed his eyes and drifted off. To all my bloggy mommies, this is sweetness personified! Blessings. On Thursday, September 13th we will begin the Moms Ministry fall semester at Bellevue Baptist Church. If you live anywhere in the area, please come and join us! This is my 19th year to teach this incredible group of mommies and I am more excited than ever to get the chance to be a part of this exciting program. I have written a 10-week Bible study on the book of James. James was the half-brother of the Lord Jesus Christ. We believe he was the first child born of the union of Mary and Joseph following the supernatural birth of the Lord Jesus. Can you imagine the family dynamics James experienced? He had a perfect older brother! Jesus was sinless. How would you have liked to follow that? We believe James did not come to believe that Jesus was indeed the Son of God until after the resurrection. Most of our Lord's family and friends rejected His claim of diety during His earthly Incarnation. Only after God raised the Lord Jesus from the dead did they believe. James' book is written from a unique vantage point and I think you will find the study to be both challenging and encouraging. So if you are near and can join us, please do. If not, you can watch the lecture series on-line. 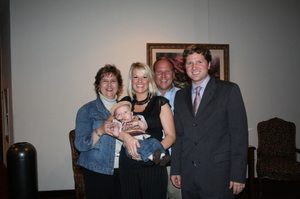 Several years ago we had a mom drive from Nashville, TN. each week to be with us. So when I say anywhere in the vicinity, I mean anywhere! Blessings. Something about India gets in your heart and you just can't get over it. I love this country. I love the people. My heart hurts when I think about it. The country is cloaked in spiritual darkness. Christianity is spreading but it is accompanied with persecution and the constant threat of death. Yet, the Christians I met in India are some of the happiest people I have ever had the privilege of meeting! I think that is what sticks with me~the devotion of these believers. They consider prayer to be work and they invest hours into it. They give "the widow's mite" out of their extreme poverty for the joy of giving to the work of the Lord. They consider the act of baptism to be extremely holy because it is an outward expression of an inward change of heart. They hang on every word with the Scriptures are taught. They group sing and chant while they wait for the Conference to start and sit patiently. They weep at the Lord's Supper. Christ is their life. Their concept of the Christan life is more about eternity than life here on earth. They faithfully lay up treasures in heaven rather than attempt to accumulate any of this world's goods. They love the Lord Jesus Christ. They challenge me in my walk with the Lord. I hope they can challenge you as you read about my beloved, India. Blessings. If you live anywhere in the Memphis area I cordially invite you to join us for the Moms Ministry at Bellevue Baptist Church starting Thursday September 13th. It is a 10-week study and registration can be done on-line. It is open to members and non-members and anyone who is interested. There is free-yes, you heard me right sista, free-childcare but registration is required. It is open to anyone and we would love to have you. This year we are studying the book of James. I have written a study called "Mirror, Mirror on the Wall." James admonished us to become doers of the Word and not merely deluded hearers who are like the man who looks in the mirror, sees his natural face and then walks away and forgets what he has seen. When you look into the Word of God, what do you see? Are you a doer of the Word? Should you not be able to join us in person, the lectures there will be a live video feed which is archived. This study on James will be the next one I will publish and it will be available in January 2008 along with DVDs and CDs. I am so excited to get started and I plan on telling all my stories about Declan and I have many! And pictures. I have pictures-oh yes I do! Perhaps you would only be available on Wed. nights. We have another option for you. Bellevue is offering the video series and study of II Timothy called "Run Well, Finish Strong" beginning September 12th. Register here for the evening Moms Ministry through the Disciple Life program. Teaching mommas with the Word of God and encouraging then through the Spirit of God is the driving passion of my life. I hope you can join me in person or on-line and study God's Word. It is life-changing. Blessings. Seriously. Can you even stand it? Declan has started to coo and chirp. Here, he is being captivated by J-J and wondering why he always see flashes of bright light whenever he hears her voice. When pondering what I should be called-which will turn out to be whatever he says, you can understand that I am sure-someone suggested I be "Cheese" since that is what he hears me say! 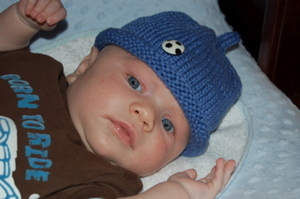 Declan, when I see you my heart hurts! Blessings.